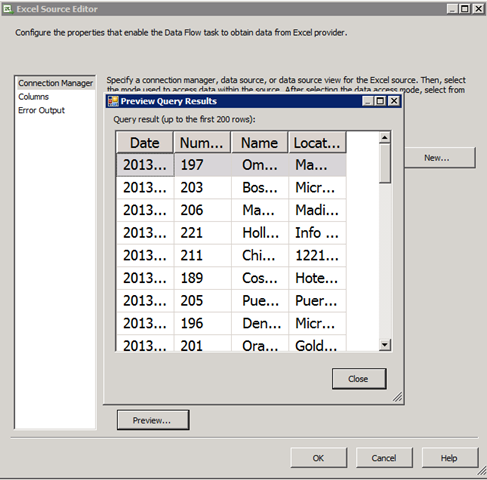 [Connection manager "Excel Connection Manager"] Error: SSIS Error Code DTS_E_OLEDBERROR. An OLE DB error has occurred. Error code: 0x80004005. An OLE DB record is available. Source: "Microsoft Access Database Engine" Hresult: 0x80004005 Description: "The Microsoft Access database engine cannot open or write to the file ”. It is already opened exclusively by another user, or you need permission to view and write its data.". The third issue typically happens if you click the Preview button on the component editor. This ends up loading the Excel file through the Access database engine, and can keep a reference to the file open until the designer is restarted. Hi, we experienced this same issue. Any further resolution on how to resolve? We had same issue and resolved by adding the SQL agent proxy account as a local user on the machine where the file was stored.